Okay, I have made it to day 4 for my NaBloPoMo challenge. I was not planning on using the daily prompts but the last couple of days seem to fit. Today’s prompt is do you feel more comfortable being a leader, follower or collaborator? How do Chinese Slow Cooker Spareribs tie into this subject? I will tell you, soon. Since I am a stay-at-home mom, I really have to be a little of everything. If I have to pick one, I would say I feel most comfortable collaborating. Working with other people can be challenging at times but for the most part, I enjoy hearing their ideas and I usually learn something new. I can be a bit standoffish and having to interact with someone helps me open up and feel more at ease. I even collaborate with my hubs, I swear! 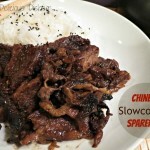 We worked together on these Chinese Slow Cooker Spareribs. Okay, he did most of the work but I did advise him on some ingredients. He enjoys cooking and coming up with new recipes, too and today he did good. Collaboration at it’s finest. We eat a lot of Asian-style meals. The main reasons being they are usually quick, easy, healthy and flavorful. This dish hits most of those points. It is quick in terms of preparation and although it take 4 hours to cook, the slow cooker does that for you and I am all for that. While ribs are not exactly fat free, just serve it with some brown rice and steamed veggies and you it will all be okay. As long as you don’t eat the whole pot by yourself. And flavorful, yes indeedy, Petey! The hoisin and soy sauce give the ribs a nice salty tang and the honey, mirin and brown sugar add just enough sweetness to round out the sauce. If that wasn’t enough, you add some Chinese 5 spice powder to the mix, one of my favorite spices. Its sweet, spicy and licoricey. It smells as good as candy. Okay now I want you to all pay close attention, here comes the hard part. Put the ribs in a slow cooker. Mix all the sauce ingredients together. Pour them over the ribs. Turn on the slow cooker. That is my kind of cookin. After about 4 hours in the crock pot, this is what you get. Beautiful. See how shiny they are? That is what the mirin will do for you. If you don’t know what mirin is, it is a sweet rice wine. Now, don’t go popping open a bottle at your next dinner party, this is used strictly for cooking. It is sweet and syrupy and this is what makes these ribs so glossy and pretty. Yep, the hubs did good. Place spareribs in a 5 quart slow cooker. Mix remaining ingredients together and pour over the ribs. Serve with steamed rice and stir-fry vegetables. These look so delicious. I have never made these or cooked ribs in a slow cooker (and I love my slow cooker…) I will have to see the butcher as I don’t see these ribs cut like this … I wonder if it matters? Can’t wait to try it. Thanks for visiting and your kind words on my cards. I am glad I got to find a fun blog to add to my cooking!! We have also used short ribs with this recipe and I liked them even better that way. I used 2 lbs of the short ribs. I hope you get a chance to try it out. Thanks for stopping by Kelley!